New Delhi, Oct 21: Prime Minister Narendra Modi on Sunday got emotional while remembering the valour of the jawans of NDRF and SDRF and said the nation will never forget sacrifices made by the country's police personnel. Speaking after dedicating to the nation the National Police Memorial in Delhi, which has been built to recognise the supreme sacrifices made by police personnel since Independence, the Prime Minister lauded the work being done by jawans fighting to establish peace in the valley and in the Naxal affected areas. 'It is my pleasure that I got the chance to inaugurate this memorial. This structure is an example of the valour and strength of our police forces. There are times when we pay rich tributes to the valour of our police personnel. Today while paying tributes I again remember the great sacrifices made by our Forces. Today, I salute all the 'shaheeds' who have sacrificed their lives for our nation,' the PM said at the function in central Delhi's Chanakyapuri area, where Home Minister Rajnath Singh, his two Ministers of State Kiren Rijiju and Hansraj Ahir and the top brass of central armed police forces (CAPFs), central security agencies and state police units were present. Mr Modi got emotional while mentioning about the contribution of personnel belonging to the National Disaster Response Force (NDRF) and State Disaster Response Force (SDRF). He said people do not even know that these people are also Khaki jawans. 'It is the day to remember every jawan who maintains law and peace in Jammu and Kashmir and fights against terrorism. Jawans on duty in Naxal-affected areas are doing a great service. It's also due to them that number of Naxal affected districts are going down and youth is coming to mainstream, the PM said. Lauding the jawans, the Prime Minister said, "it is the result of your alertness that the elements which create unrest are unsuccessful in their attempts. The attempts to create fear and insecurity in the nation were foiled by you. The peace prevalent in the nation is possible only due to your services." The Prime Minister attacked the previous government for delay in establishing the National Police Memorial. 'The previous government did not let this memorial to be built. Advani ji inaugurated this during Atal ji's tenure and then UPA Government came and the work stopped. Now the NDA Gvernment has completed this work. I question the previous government for not respecting the valour of our Security Forces,'the PM said. This is the country's first National Police Museum. After his address, the Prime Minister honoured the survivors of the Hot Spring Incident, on National Police Memorial Day. In the incident, 10 policemen were killed in an ambush by Chinese troops in 1959 in Ladakh's Hot Spring area. Mr Modi also announced an annual award for police personnel who contributed outstanding service during rescue operations. The award has been named after Netaji Subhas Chandra Bose. 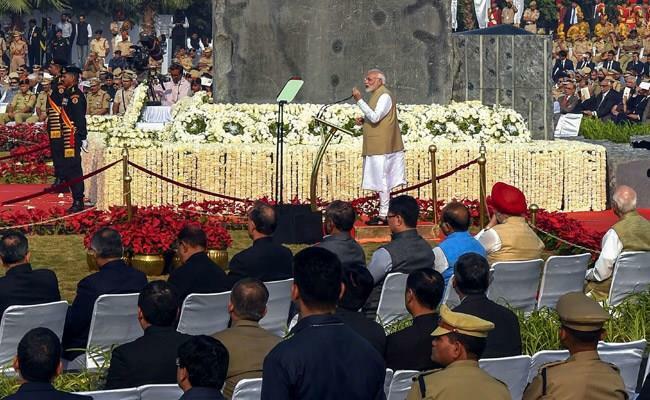 Mr Modi laid wreath at the National Police Memorial. The memorial is erected on 6.12 acres of land in Chanakyapuri in recognition of the supreme sacrifice made by police personnel since independence. Earlier, Mr Modi attended the Police Commemoration Day Parade. Mr Modi also dedicated a Police Museum to the country. The museum depicting the history, artefacts, uniform and gear of central and state police forces is coming up as an underground facility in the premises of the national police memorial. The museum project is being steered by the Intelligence Bureau (IB) in coordination with the Central Armed Oolice Forces (CAPFs) that function under the command of the Union Home Ministry. Earlier, Mr Modi, Union Home Minister Rajnath Singh and vetaran BJP leader LK Advani paid tributes to the policemen killed in an ambush by Chinese troops in 1959 in Ladakh's Hot Spring area, on National Police Memorial Day today.